John Graham has forged his role as a global leader over five decades. A U.S. Foreign Service Officer for fifteen years, he was in the middle of the (first) revolution in Libya in 1969, then led a team in one of the most difficult and dangerous areas of the war in Vietnam. For three years in the mid-seventies, he was a member of NATO’s top-secret Nuclear Planning Group, then served as a foreign policy advisor at the U.S. Congress for Senator John Glenn. At the United Nations, he led a team of American diplomats wrestling with the political and economic problems of the developing world. He's helped lead the Giraffe Heroes Project since 1984 and is now President of Giraffe Heroes International. His leadership of environmental groups in the Pacific Northwest has led to major progress on key issues. Graham gives speeches and seminars on leadership and civic engagement all over the world. His books, articles and blogs make him a frequent commentator on major television and radio programs and in print. Here is the English version of a short interview I did with NTV March 22. NTV is Russia broadcast television and under Kremlin control. But I am not censored and was able to get my views on NATO/Russia tensions out to a lot of Russians (NTV claims a viewership of 102 million for the Sunday primetime news magazine show I was on). Egypt continues its military operations in Libya against Islamic-State-aligned militants. 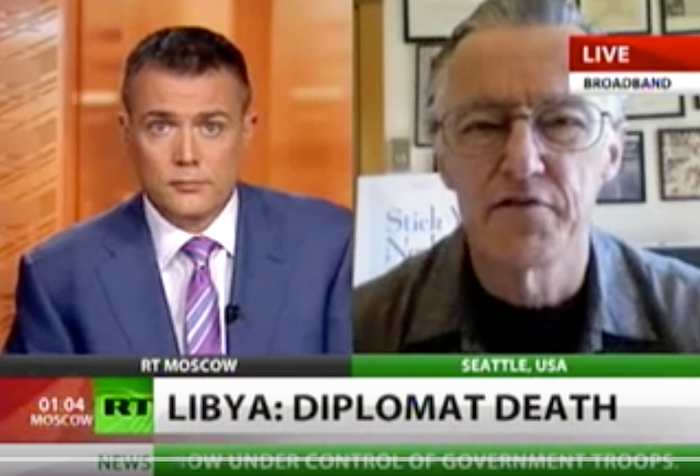 John Graham, a former US diplomat based in Libya, tells RT America’s Anya Parampil that “NATO should have known that ISIS thrives on chaos,” and that the need for US-Russian cooperation on Libya and related problems is vital. KPLU, a Seattle NPR affiliate, interviews John Graham and his daughter Malory, both survivors of the burning and sinking of the cruise ship Prinsendam in October 1980. The Coast Guard calls this rescue- in a violent storm in the Gulf of Alaska-- "the greatest air-sea rescue ever." Author and motivational speaker John Graham talks about his adventurous early years--and how they led to a life of service--on "KCTS 9 Connects" with host Enrique Cerna. John Graham doesn't often get a chance to talk publicly about the three years he spent as as mystic, but a gathering on Whidbey Island gave him this opportunity. Washington Post, "The Mess We Left Behind"
UU World, "Stick Your Neck out for a Meaningful Life "